While there are many, many days when life on this farm isn't so glamourous, there are many, many more days when it can be downright magical. The story of Maggie, the duck, is one of those magical things to me. 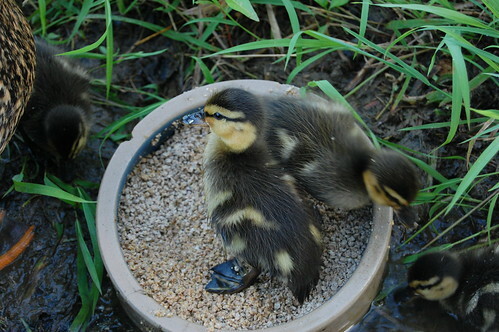 Maggie arrived in our lives late last summer, when my husband showed up from work with a box of three baby ducklings. And I have to admit I was less than excited. I was borderline angry. I was pregnant, hot, exhausted and not in the mood to have a plastic tub of ducklings taking up space in my downstairs bathroom. But quickly, my heart softened. It may have been that first day when we carried them upstairs in a box and gave them a swim in the bathtub. Watching their pure bliss and glee in water would soften the hardest of hearts. Before long, we were moving them out doors and realizing we needed a bigger bath tub. Eventually they began to test their wings and realizing they could fly, took off on flight plans around the farm that got longer and wider and farther away with each passing day. One day, we let them in on the secret we'd been hiding from them. That there was a cool, flowing stream just a short waddle away. But still they came home. And then, as the cool fall days came, they left one by one and their flight plans took them away from our home. This April, we were surprisingly and sadly reunited with one of our ducks. At first, we weren't sure she was ours, but when she wandered around the cats and dogs without a care, and perked up at my "duck-duck" call, I had a feeling she was one of ours. So we nursed her back to health, and one day she flew off again. But this time, she kept coming back. She'd show up each morning, each evening, sometimes in the afternoon. 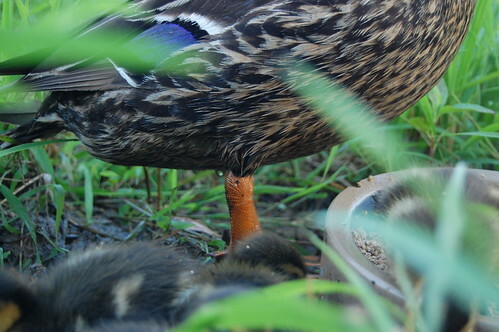 We'd hear her laughing quack in the yard and know she was out looking for food. She'd follow the girls around the yard, like a dog, right at their heels. Eventually, she kept sticking around and would duck (no pun intended) into the big leafy hostas in the flower garden beside the steps and stay there all day. And then, one day there was squealing and screaming from the yard. 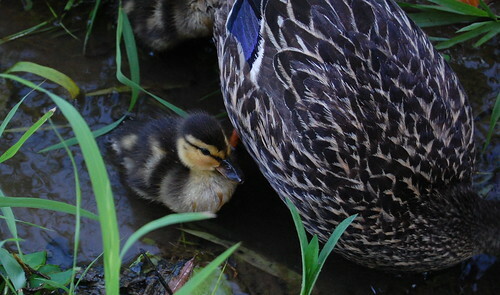 Maggie was wandering around with five of the tiniest, fluffiest, chubbiest little ducklings waddling along behind her. Now, if you know about our animal kingdom, you also know we have a small population of barn cats that lounge around the place as well. So envisioning five fluffy ducklings in the mouths of five fluffy cats, I immediately put a cage over top of Maggie and her babies. But after a day or two of being caged, I could tell Maggie was desperate to get out. I had to trust that she would protect them and I had to trust that our cats were smart enough not to bother these babies on my watch. We let Maggie out and she made a beeline for the little stream that runs down by the chicken coop. And again, we witnessed the pure bliss of these ducks as they swam, nibbled on grass, chased after bugs and shoveled through dirt and algea on the bottom of the stream bank. I knew letting them out was the right decision. But now I had no idea how I'd get them home. I decided to leave that stress to Dan when he got home from work that night. But we didn't even need to worry. As we sat outside eating dinner, Maggie and her five little ducks came waddling back into the yard. One by one, she led them back into the garden and settled down in a shady spot under the hostas. And she sat calmly as we placed the cage over her and her babies, protecting them from whatever predators might be wandering around through the night. And so, that has become our routine. We let them out in the morning. They wander among the dogs and cats and chickens, looking for some feed and a little water. And then they head to the stream where they swim and sun and nap the day away. And then, come nightfall, Maggie brings them home. Where I can safely tuck them in for the night, knowing they'll be safe from harm. It's magical, I tell you. What a lovely story~thanks so much for sharing it. 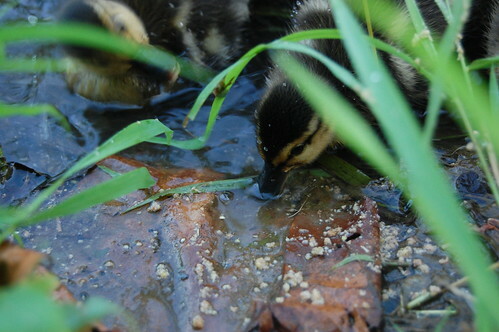 We’ve had ducks before too and there is just something so earthy and beautiful about them~isn’t there? um, can we come over next week? friday maybe? Magical is the perfect word for it! It gives me that safe feeling that happens at the end of the day, though I have no cage around me! Isn’t God good? He provides us with all this magic in the midst of the world’s chaos. 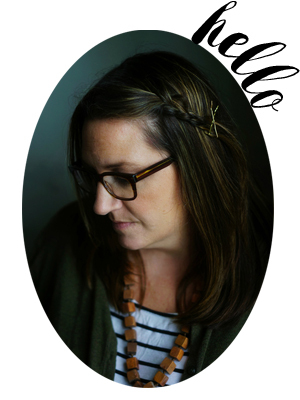 I’m blessed to have found your blog and the magic it brings to my life. 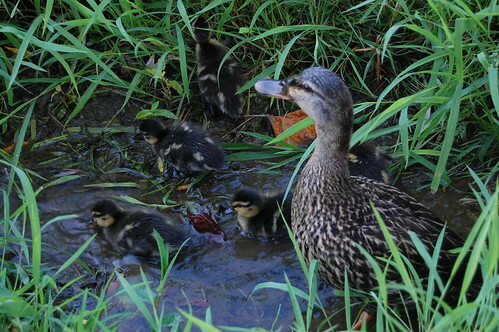 I love your “Make Way for Ducklings” style story:) Thanks for sharing it. so true, krystal. and thank you! OOOhhh! So adorable!! Aunt Lauren wishes she could pick them each up and cuddle and kiss them all! 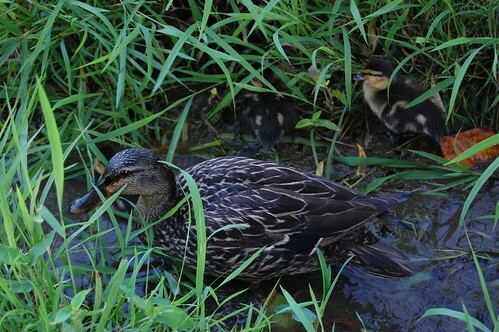 Saw a mother mallard with at least 6 ducklings at City Park today. You need to publish this story, Molly. Such a good one. Sweet story, and what sweet ducklings!!! What a beautiful story! So sweet. My dad grew up on a farm, and my sis still lives there….it’s stories like this that make me want to sell our surburban lot and move back to the farm! Isn’t that mothering instinct amazing? We all (well, most of us) look for a place where we feel safe, where food is readily available, where comforts abound before we embark on motherhood. And isn’t is humbling to know that the kindness you showed Maggie last year stuck in her mind somehow, so that when the time came for her to become a mother, the place she most wanted to be was your corner of the whole, wide world? I just love this! They are so fuzzy. ducks add so much to farm life. i adore this story! Ohhhh. Sweetest thing I’ve read in a long time. Thank you Mols.